Batali/Bastianich Group mixologist Lucas Swallows has one of those names that’s too good to be true — you know like the florist named Rose Flowers or a lumberjack named Mark Wood. Hugh Alexander Curtas (d.o.b. 10-15-84 – The Official Number Two Son Of ELV) once had Mr. Earthman for a geography teacher, and there is actually an attorney in New York called Sue Yoo. None of which has anything to do with anything other than establishing that perhaps Swallows was born to be bartender. Because of him and some other mixmasters like David “Coop” Cooper, Carnevino has one of the tastiest and aggressive cocktail programs in our humble burg. As you can see from the luscious snaps above, these are cocktails made from fresh infusions, house-made syrups, and top shelf booze — all of which come together in libations of unparalleled smoothness and complexity — no mean feat that. They make hanging at the bar at Carnevino (whilst also nibbling on the peppery, house made-grissini), one of the primary pleasure panaceas in our party-town, and a perfect way to prime the pump before partaking of this place’s prime — in everything from porterhouses to pork. 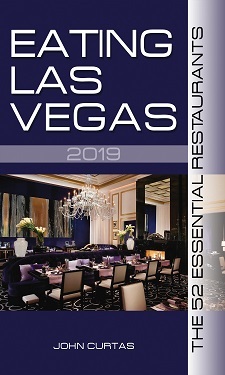 VEGAS magazine editor Abby Tegnelia and ELV hit Carnevino recently to taste some of those tasty libations, but also to interview one, Nicole Brisson, the only head chef in any steakhouse in town we know of, for a future article in Abby’s ‘zine. It also gave us a chance to introduce Abby to the ultra-aged beef for which Carnevino is justifiably famous, and do some further…er…uh…research for the article we’ll be writing for her. It also gave us an excuse to go drinking with Nicole, Executive Chef Zach Allen and Manager Doug Zamensky — three youngsters who convinced ELV, by their youthful drinking stamina, that he should always call it a night as soon as dessert is finished. We would’ve been fine had we ended the evening after a few sips of the (excellent) house made digestivos, instead we soldiered on through a tour of downtown watering holes. Fun times all around, but silly us…we forgot two-day hangovers are no fun. In the future, we’ll stick to those steaks…and swallow whatever Lucas is pouring. THAT is really interesting looking pastrami.